The incremental shuttle walk test (ISWT) was developed to simulate a cardiopulmonary exercise test using a field walking test. Note: The ISWT is available from Prof Sally Singh, Department of Respiratory Medicine, Glenfield Hospital NHS Trust, Groby Road, Leicester LE3 9QP, UK or email: visit: http://www.leicestershospitals.nhs.uk/aboutus/departments-services/pulmonary-rehabilitation/for-health-professionals/incremental-shuttle-walk/ for further information on how to access.. The patient is required to walk around two cones set 9 metres apart (so the final track is 10 metres) in time to a set of auditory beeps played on a CD. Initially, the walking speed is very slow, but each minute the required walking speed progressively increases. The patient walks for as long as they can until they are either too breathless or can no longer keep up with the beeps, at which time the test ends. The number of shuttles is recorded. Each shuttle represents a distance of ten metres (i.e each time the patient reaches a cone is 1 shuttle). The results of the ISWT can be used to prescribe the intensity of walking training (see Exercise Training section). Standardisation of the ISWT is very important for obtaining meaningful outcomes. The best result is recorded. If the repeat test is performed on the same day, 30 minutes rest should be allowed between tests. Debilitated individuals may require tests to be performed on separate days, but aim for tests to be less than one week apart. Only standardised instructions from the CD should be used. In contrast to the six-minute walking test, no encouragement should be given throughout the ISWT. 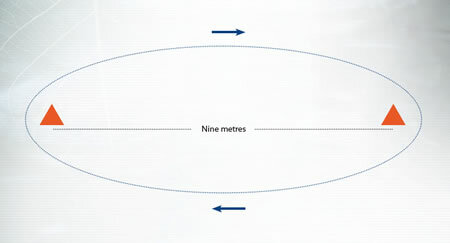 Cones are placed nine metres apart. The distance walked around the cones is 10 metres. The equipment needed to conduct the ISWT is identified in the attached checklist. Instruct the patient to dress comfortably and to wear appropriate footwear. Any prescribed inhaled bronchodilator medication should be taken within one hour of testing or when the patient arrives for testing. The patient should rest for at least 15 minutes before beginning the ISWT. * Note: Show the patient the dyspnoea scale (e.g Borg scale) and give standardised instructions on how to obtain a score. The object of the progressive shuttle walking test is to walk as long as possible, there and back along the 10-metre course, keeping to the speed indicated by the bleeps on the audio recording. You will hear these bleeps at regular intervals. You should walk at a steady pace, aiming to turn around the cone at one end of the course when you hear the first bleep, and at the other end when you hear the next. At first, your walking speed will be very slow, but you will need to speed up at the end of each minute. Your aim should be to follow the set rhythm for as long as you can. Each single bleep signals the end of a shuttle and each triple bleep signals an increase in walking speed. You should stop walking only when you become too breathless to maintain the required speed or can no longer keep up with the set pace. The test is maximal and progressive. In other words, it is easier at the start and harder at the end. The walking speed for the first minute is very slow. You have 20 seconds to complete each 10-metre shuttle, so don’t go too fast. The test will start in 15 seconds, so get ready at the start now. Level one starts with a triple bleep after the 4-second countdown. Each minute, record heart rate, SpO2 % and dyspnoea as well as number of shuttle that is completed as on the ISWT recording sheet. The patient is more than 0.5 m away from the cone when the beep sounds (allow one lap to catch up). The patient reports that they are too breathless to continue. Chest pain that is suspicious of / for angina. Seat the patient or, if the patient prefers, allow to the patient to stand. Immediately record oxygen saturation (SpO2)%, heart rate and dyspnoea rating. Two minutes later, record SpO2% and heart rate to assess the recovery rate. Record the total number of shuttles. The patient should remain in a clinical area for at least 15 minutes following an uncomplicated test. The change in the distance walked in the ISWT can be used to evaluate the effectiveness of an exercise training program and / or to track the change in exercise capacity over time.